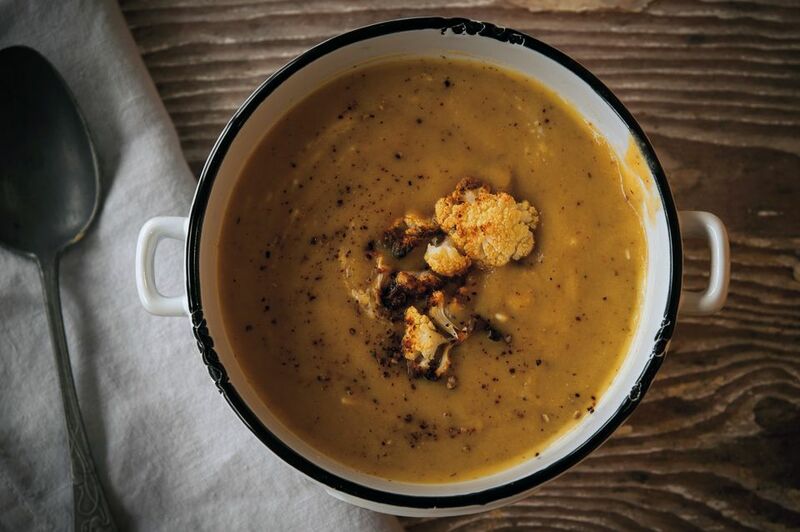 Want to beat the winter blues or simply need a healthy, nutritious and tasty dish then look no further than this Roasted Cauliflower and Turmeric Soup. Just how and when did cauliflower get this good? When we started roasting it, a process which retains all the fabulous flavour of the cauliflower and more as the sweetness is enhanced and it takes on an incredible nuttiness too. Roasting keeps so much more of the nutrients too, which, if you are interested, includes a decent dose of vitamin C, folate and a good source of fibre and vitamin K.
The soup is thickened with potato so will also suit many diets including vegetarians, vegan, gluten and dairy free. Something of a Super Soup. Take the cauliflower and break into either florets or thick slices (both ways work). Lay the cauliflower onto a baking sheet. Sprinkle with four tablespoons of the olive oil and toss the cauliflower around to make sure it is covered. Sprinkle with a good pinch of sea salt flakes. Pop the tray into the center of the preheated oven and roast until the cauliflower edges are well browned and almost turning black, but not burnt; this should take about 15 minutes. While the cauliflower is cooking, heat the remaining oil in a large soup pan until hot but not smoking. Stir well and then cook for two minutes. Add the garlic and stir again. Cook for five minutes to soften the vegetables. Add the turmeric to the hot stock and give it a good stir. If using fresh, peel the turmeric with the edge of a teaspoon, place it into the hot stock and bring to a gentle simmer for 5 to 10 minutes or until the stock takes on a lovely golden color. Strain before adding to the soup. Pour the turmeric stock into the cooked vegetable and add the potato chunks. Bring to a boil and cook for 10 minutes. By this time the cauliflower should be cooked. Reserve a few roasted florets for garnish and add the remaining cauliflower to the soup. Cook for another 10 minutes making sure the potato is cooked through by testing with the point of a sharp knife. Pour the soup carefully into a food processor or Thermomix if you have one and blend to create a smooth, thick soup. Serve hot in warmed bowls and garnished with the roasted florets. The soup will keep for a few days in the refrigerator and also freezes well.